In addition to the Campbell “brothers” (the subject of Part 1 in the March Skeptical Briefs ), the other major spiritualists whose mediumship produced “spirit” paintings were the Bangs sisters of Chicago. Misses Elizabeth S. and May E. Bangs were reportedly mediums since childhood, but their “gift” of spirit painting did not appear until the fall of 1894 (Chesterfield 1986). They offered clairvoyance, séance trumpet effects and spirit “materializations,” “direct” (or so-called automatic) writing, spirit typewriting, and slate effects. But they were most famous for their allegedly ghost-rendered paintings. Their business card advertised, “Life Sized Spirit Portraits a Specialty” (“Bangs Sisters” n.d.; Swann 1969). Indeed, they appear to have made something of a racket of it, as indicated by an Associated Press story of 1908. A woman who alleged to be the wife of a Chicago millionaire accused May Bangs of enticing him into a bigamous relationship, the man having been, it was claimed, “inveigled into the marriage through the instrumentality of a ‘spirit portrait’ of his dead mother”-produced by the Bangs sisters (“Spirit” 1908). The Bangses were exposed as tricksters many times. For example a minister, Rev. Stanley L. Krebs (1901) sat for one demonstration that involved producing a “spirit” reply to a multi-paged letter that he had been instructed to bring, sealed in an envelope. At the beginning of the séance it was placed between two bound slates. Careful observation, and the use of a small mirror that permitted viewing under the table, allowed Krebs to see how the bound slates were secretly wedged apart and the envelope dropped into Miss Bangs’s lap from whence it was transferred to a tray on the floor and drawn under a closed door. In time, after her accomplice/sister had done her work of steaming open the envelope and penning a reply, the seemingly impossible effect was completed. The sisters used a variety of techniques for their spirit portraits. Typically, for reasons skeptics may well imagine, “their method was to have the sitter bring a photograph of the dead person to be painted, and the following day the spirits would paint the portrait . . .” (Mulholland 1938, 158). For one-day service, the photograph was reportedly “concealed” from the sisters’ view (Swann 1969, 4), but they may have gotten access to it much as they did the previously described letter. According to a booklet published at the Indiana spiritualist colony Camp Chesterfield (where the Bangses had a cottage for a number of years), the sisters’ earliest work involved “a locked cabinet or curtained off space” and “several ‘sittings’ were necessary.” Later, the “canvas” (actually a paper-mounted panel) was placed before a window with light streaming through, and the sitter watched the picture progress over a period of up to forty minutes or so. Still later, the sisters were able to produce artworks in “as little as five minutes” (Swann 1969, 3). Reportedly, the Bangs sisters’ portraits were examined by unnamed “art experts” who concluded they were not done in any known artistic medium. Rather, the colored substance “could be compared to the dust on a butterflys [sic] wings” (Swann 1969, 3). That is, the particulate matter resembled pollen, and would thus seem consistent with a pastel “painting” (i.e., a drawing done in pastel crayons, which consist of pigment mixed with gum). In fact, at Lily Dale, a spiritualist community in Western New York, where the sisters resided for many seasons, I was able to examine two of their “spirit” portraits that were framed and mounted under glass (as would be expected for certain media, like watercolors or pastels, but not others, e.g., oils). I used an illuminated 10X loupe for the inspection. Having myself done portraits in oils, pastels, watercolors, and numerous other media, I saw very familiar characteristics that I could not distinguish from ordinary pastel renderings (Woolwich 1996), including layering and blending of colors and even unmistakable crayon strokes (as in the hair; see figure 1). Indeed, although claiming that, for some pictures, the spirits under the Bangses’ mediumship furnished “their own colouring matter,” one contemporary source stated that “for the usual portraiture, coloured French pastels are placed in front of the canvas and these are used by the spirit artists-by a process called ‘precipitation’” (Coates 1911, 294). But how were the pictures actually produced? The evolution of their techniques would seem consistent with deception. The early cabinet method suggests the pictures were simply painted by the sisters out of patrons’ view, and the latest productions (done in “five minutes”) no doubt involved the substitution of a previously prepared picture. The ‘window’ technique is interesting, and to my knowledge the secret has never been revealed publicly. Two identical, paper-mounted canvases in wooden frames were held up, face to face, against the window, the lower edges resting on a table and the sides gripped by each medium with one hand. A short curtain was hung on either side and an opaque blind was drawn over the canvases. With the light streaming from behind[,] the canvases were translucent. After a quarter of an hour the outlines of shadows began to appear and disappear as if the invisible artist made a preliminary sketch, then the picture began to grow at a feverish rate and when the frames were separated the portrait was found on the paper surface of the canvas next to the sitter. Though the paint was greasy and stuck to the finger on being touched, it left no stain on the paper surface of the other canvas which closely covered it [Fodor 1933]. With the house lights off and while all eyes are intent upon the white illuminated canvas, slowly and faintly at first, a dim shadow appears. Gradually this shadow grows larger and becomes more distinct. The outlines begin to take shape, colors appear, and in a few short moments, a perfect finished picture in all its brilliancy of color is before them. Thayer’s catalog did not, of course, explain how the trick worked, but-significantly-prepared “spirit” portraits were sold with the apparatus. Whatever the secret, it may have been virtually identical to the method used by the Bangses. One notes that, like theirs, the Thayer method employed two canvases, and I think therein lies the crux of the matter. After considerable experimentation, I have found a way to produce what seems a very similar effect. Someone witnessing it might well write, as one of the Bangses’ clients did (Payne 1905): “At first it was a faint shadow, then a wave appeared to sweep across the canvas, and the likeness became plainer. It was a good deal like a sunrise-got brighter until it was perfectly plain and every feature visible.” The effect is of a picture seeming to slowly materialize and gradually coming into focus. Indeed, that is just what occurs in the method I came up with. Briefly, here is my hypothetical reconstruction of a Bangses’ spirit-picture séance. Prior to the client entering the room, the previously prepared picture (rolled up perhaps) is secreted in its hiding place (for example in a drawer on the back of the table). The sitter is invited inside, allowed to casually inspect the premises, and invited to take a seat. The two blank panels are placed face to face, stood up on the table, and held by a sister seated on either side. The aforementioned short curtains are drawn to each side and the opaque blind pulled down. The spirits are invoked, while under cover of the drawn blind, one sister uses her free hand to extract the picture from its hiding place and attach it to the face of the rearmost panel which is laid on the table behind the other panel. All is now ready for the blind to be raised. 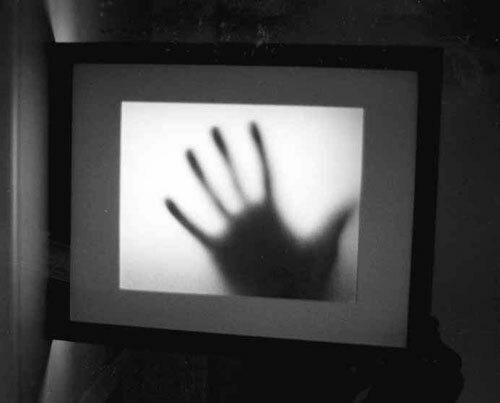 Figure 2: Two paper panels are placed together before a window (or in this case a light box), with a hand showing nothing else is interjected. 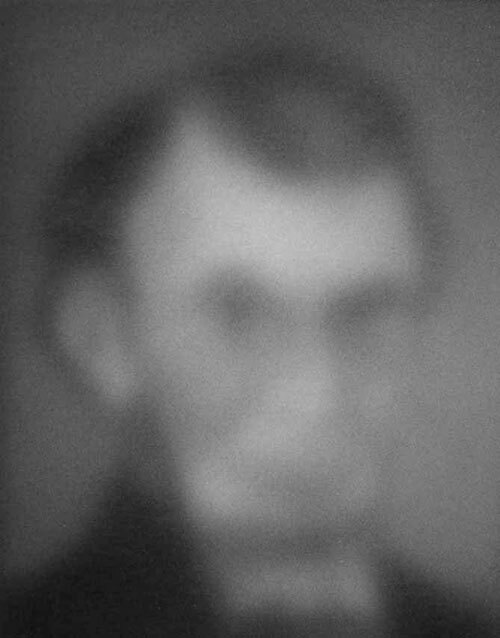 Figures 3-5: In the transmitted light a “cloudiness” forms (not shown), then colors and shapes gradually come into view; A face begins to be recognizable and eventually becomes even sharper; Finished portrait on one panel (shown in reflected light) is presented to sitter. 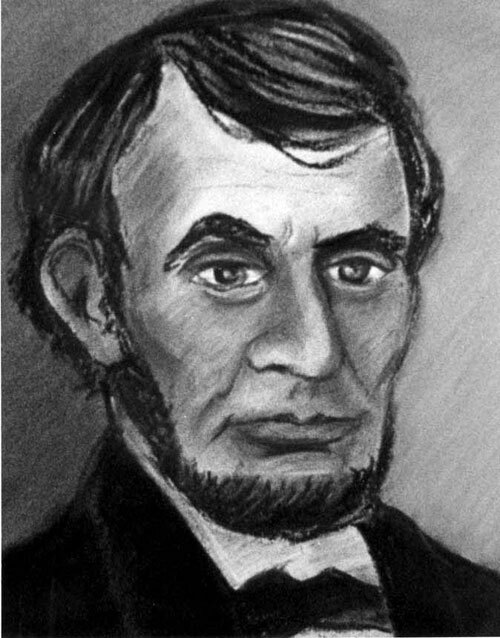 Lincoln pastel portrait and photos by author. This is consistent with the methodology I have described, it having been merely necessary to “flop” (reverse) the picture panel as it was returned to its place on the table. In some accounts the picture behind the screen seemed to be manipulated in and out of focus. For example, one witness described how the developing image “disappeared, but came back very soon clearer than before” (“Bangs Sisters” n.d.) One case featured an illusion involving “three pairs of eyes” that “showed on the canvas at once in different poses and places” (an effect that could easily have been accomplished with a separate sheet of paper on which the sets of eyes were rendered). light) the open eyes became dominant and she suddenly awoke. This effect may have been copied by the Bangs sisters, although it would have been accomplished differently, since the portrait-side of the finished picture would have required open eyes. Having closed eyes behind (as on an overlay) would not seem to work, since the open eyes (with their dark irises and pupils) would still dominate from the beginning. There may be several ways to solve the problem: the effect might simply have been produced by tipping the picture forward so that the eyes were brought into focus, coupled with the power of suggestion; or the finished, open eyes might actually have been drawn in, in a final stage, under some pretext of pulling down the opaque blind; or by some other method. (For example it is possible to have a removable, opaque material applied on the back to the area behind the eyes so that, in transmitted light, there appear deep, shaded sockets, but when the material is peeled off the eyes open.) In any event one sitter did report that, before opening, the eyes of the spirit portrait were ”indistinct and apparently closed” (emphasis added; Holland 1909). Entering the seance-room, and finding only three canvases, I selected two of them, took them out in the sunlight, in company with one of the Miss Bangs, exposed them for fifteen minutes to the strong rays of the noonday sun, examined the surface thoroughly to fully assure myself that they were not chemically prepared, at the same time to secretly mark them for identification. 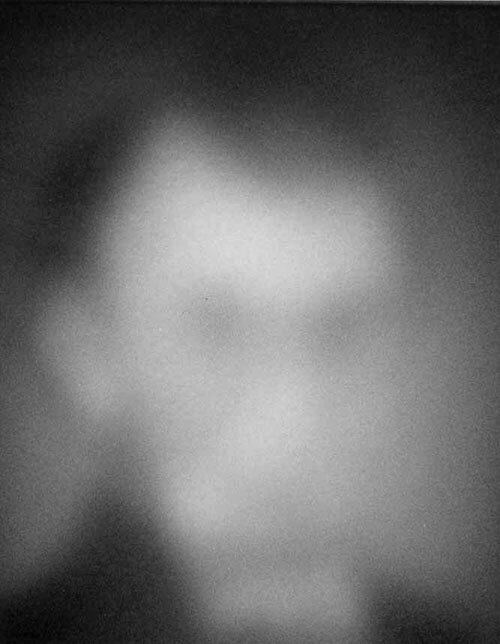 One incident is particularly revealing: A couple who had sought a picture of their deceased son concluded that the resulting image resembled him only “in a general way” and “was not even a fairly good portrait.” In rationalizing the failure, one writer pointed out (perhaps more wisely than he knew) that the couple “had no photograph of their departed son with them” (Coates 1911, 325). Thus the Bangs sisters were apparently left with few options. They could fish for a description (in the manner of a police artist eliciting an eyewitness’s recollection) or opt to produce a generalized child’s portrait which the credulous couple might accept. In contrast, when a photograph had been brought to the sitting, the “spirit” painting might be pronounced “a perfect enlargement of the original . . .” (“Bangs Sisters” n.d.). Whatever techniques the sisters actually employed – and May Bangs (1910) acknowledged that “No two sittings” were “exactly alike” – they were obviously effective, given the many testimonials they elicited. Significantly, as physical mediumship has largely given way to mental phenomena (witness the rise of mediums like James Van Praagh who limit themselves to readings [Nickell 1998]), “spirit” paintings have all but disappeared. A few historic examples remain as reminders of an earlier, though not necessarily more credulous, time. I am most grateful to Joyce LaJudice of the Lily Dale Museum, Lily Dale, New York, for her generous assistance in providing information on the Campbell “brothers” (Part I) and the Bangs sisters (Part II). Thanks are also due several Center for Inquiry staff members for help in various ways, particularly watching numerous experimental attempts to reproduce the Bangs sisters’ effects: Ben Radford, Tom Flynn, and others-including Tim Binga and Ranjit Sandhu, who also provided research assistance. If it is true, as earlier stated, that the picture seemingly appeared on the “canvas” nearest the sitter, all that would have been needed was for the pair of panels to have been casually reversed as they were taken down from the frame and carried to the sitter. I have wondered whether the Bangses might have produced a picture in “real time,” working on the rearmost panel (reversed for the purpose) while the sitter viewed the progress. Such a scenario (too lengthy to detail here) would present many difficulties, and one would think even a credulous sitter would catch on. But it might still be possible. Bangs, May. 1910. Letter dated 17 September, quoted in Coates 1911, 294. “Bangs Sisters.” N.d. Album of clippings, photos, business card, etc., in Lily Dale Museum. Chesterfield Lives. 1986. Chesterfield, Indiana: Camp Chesterfield. Coates, James. 1911. Photographing the Invisible . N.p. [USA]: The Advanced Thought Publishing Co., 292-336. Fodor, Nandor. 1933. Encyclopedia of Psychic Science . London: Arthurs Press, s.v. “Bangs Sisters,” 27-28. Holland, George C. 1909. Quoted in Coates 1911, 325. Krebs, Stanley L. 1901. A description of some trick methods used by Miss Bangs, of Chicago. Journal of Society for Psychical Research 10.175 (January): 5-16. Moore, W. Usborne. 1910. Quoted in Coates 1911, 298-299. Mulholland, John. 1938. Beware Familiar Spirits . Reprinted New York: Charles Scribner’s Sons, 1979. Nickell, Joe. 1998. Investigating spirit communications, Skeptical Briefs, September, 5-6. Payne, John W. 1905. Quoted in Coates 1911, 295-296. “Spirit Portrait” of his dead mother. 1908. The Buffalo Evening Times (Buffalo, N.Y.), January 8. Swann, Irene. 1969. The Bangs Sisters and Their Precipitated Spirit Portraits. Chesterfield, Indiana: Camp Chesterfield. Thayer Magic Mfg. Co. 1928. Quality Magic Catalog No. 7. Los Angeles. Two pages describing the spirit-painting effect are reproduced in William Doerflinger, The Magic Catalog (New York: E.P. Dutton, 1977), 196-197. Thurston, Dr. and Mrs. H.E. 1910. Quoted in Coates 1911, 322-324. Woolwich, Madlyn-Ann C. 1996. The Art of Pastel Portraiture. New York: Watson-Guptill.